I’ve known Scott Gardner since 2003 when we were both on a committee for the Syracuse Chamber. Back then he gave me a brief lesson on how real branding works; of course I didn’t use any of what he told me. 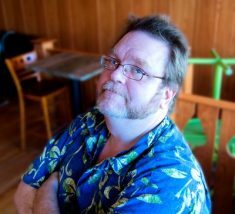 He graduated with a BS in Marketing from the State University of New York at Oswego, has an associates degree in advertising art, and he’s been the sole proprietor of Agilé Marketing Services since 2003. I hope you enjoy his responses to my questions about marketing and branding. 1. What’s the difference between marketing you learned in college and marketing in the real world? I had a different college experience. As I was taking classes in cinematography (making feature films), I needed a job, so I took one with an international cutting and precision tool company. I got a promotion in a few months, and the next thing I knew I was flying across the country to work a trade show. I went up from there. It took almost 15 years before I went back to college, and another 8 before I went back to get an undergrad degree in Marketing. College will teach you the basics. The classes give you a taste of the subjects you’ll be exposed to “on the street.” College right after high school will also expose you to a much wider range of folks than you interacted with as a teen. It’s a great way to break in easy. Skipping this is like jumping into the deep end of the pool with no swimming lessons. You sink, or you succeed. I was able to make a ton of mistakes while getting paid. I met folks who held me down or used me in some way. I also met some wonderful people who gave me 2nd, 3rd and 4th chances, and who gave me a hand up when I didn’t think I needed one. College cannot prepare you for everything. You can only really realize what you learned by looking back. Someone once said, “The difference between school and life is that in school you learn the lessons first, then take the test. Life tests you, and that’s how you learn the lessons.” Applies equally well to marketing. 2. I’ve always said that marketing is the most important skill for everyone to learn, whether they’re selling anything or just themselves. What’s your take on this? You’re marketing yourself by smiling when you meet a new person, or by saying Please and Thank You. Selling is a part of marketing (yes, that’s almost a religious argument – I know), so you’re always selling or marketing someone or some thing, even if you’re not an entrepreneur or business owner. 3. When I first met you, you mentioned that helping companies figure out their branding can be expensive. I’ve met people who’ve paid big money for it. Do you feel it’s good marketing to come up with a word that doesn’t exist and work on branding it or take a word that already exists and expand on it? First of all, people need to understand that a brand, be it a brand for your business or a personal brand (buzz phrase! ), exists only in an individual’s mind. My thoughts on a fast food place is the “real brand.” The same with every other person familiar with that restaurant. There are a million brands out there for the exact same place. You can try to influence that brand, massage it, associate feelings about your company with it, but ultimately how an individual feels about a person or company IS the brand. The name of my company, Agilé [pronounced ah-zhill-AY] is essentially a made-up word. It sounds French, but there’s no French word like that. The entire pharmaceutical industry is built on made-up words. You do that so you have a blank canvas to paint your brand on. But if your name is Joe, and you run a lawn care business, it’s best to just call your business “Joe’s Lawn Care” or “Lawns By Joe” or some such. Be as honest and direct as you can about what you do. It will save you a ton of time and money down the line. 4. In your book “Profitable Web Hosting”, you allude to the fact that the easiest branding is using one’s name. Is it also the most effective way to brand? Again, branding happens in the mind of your audience, and it’s based on what you do. Ideally you want them to associate happy feelings about your company. The best way to do that is to 1) Do what you promise 2) When you promised to do it 3) At the price you promised. That said, most people will ignore you until there’s a perceived problem. It’s how you handle those problems that really build your brand. You want to give them a superior experience, especially when they’re unhappy. It doesn’t matter if you’re running a web hosting business, walking dogs, or building and delivering automobiles. 5. I wrote an article titled Offline Marketing Is Important, Even If Your Business Is Online; would you agree that there needs to be an offline component to marketing? While we deal with many businesses online, doing so 100% of the time is still small. Sitting and watching your online Netflix account in the living room is not really “online” in the minds of most folks, I believe. True, it’s easier to be in a foul mood and not convey that when you’re interacting totally online, but it’s also impossible to give a 100% positive attitude to someone through a keyboard. Humans are a gregarious species – we thrive on contact with others. “The most beautiful sound is our own name.” Automatically inserting a personal name in an email doesn’t quite reach that bar. I think you can have a successful business online, but it won’t be exceptional until you add human contact. 6. Conversely, do you see the benefit of even brick and mortar businesses finding a way of marketing themselves online? I believe that nowadays it’s essential to do both for 80% of businesses. I think most corner stores and bodegas can get away with not having a complete web site, but they should still have a web page listing their phone number and address. For better or worse, more people are interacting with the world through their phones and tablets. You need to be able to be reached by people on foot or in cars. 7. Is marketing “marketing”, or are there great differences between marketing offline versus using social media to market? 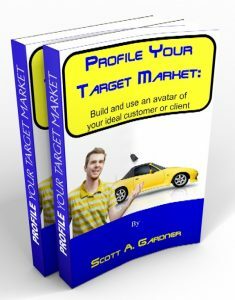 In my latest book, Profile Your Target Market, I spend a chapter talking about Social Media Marketing. As I say: Social media is called SOCIAL for a reason. If you’re a sales person, you don’t want every message on your social media pages to be hard sales. You want to develop a relationship with people. That relationship – that give and take – IS marketing. And it doesn’t matter if it’s online or in person. 8. The same question as above, only regarding advertising? Advertising is part of marketing, but only a part. Advertising is buying a presence to say wonderful things about yourself in someone else’s media. I think in our society we take advertising with a whole shaker of salt, and not just a grain. But when combined with content in the same medium – say, and ad placed next to a flattering article in a magazine – it gets transformed in the reader’s mind. Or a banner ad on a page extolling your company’s virtues. It doesn’t matter whether its online or off. 9. In your latest book “Profile Your Target Market”, you talk about the concept of “target market avatar”. Since the term “avatar” probably means something different to the masses, could you give a short definition of your belief and why it’s important? An avatar is something that stands in place of someone or something else. The idea is to build a profile of your idealized customer or client. You need to know everything about them – age, race, income, housing location, recreation and media consumption choices, etc. You even give them a name. You personalize a group of people that have similarities you can list. And then, you craft your marketing messages to that person. All your marketing messages should be addressed to an individual and not a group. Writing or producing for an avatar helps you to do that. 10. I’m going to be truthful; both books confirm that marketing/branding/advertising properly is a heck of a lot of work. What percentage can small businesses hope to actually achieve and what’s the most important thing they should tackle? Anything worth doing is going to be hard. A lot of businesses close because they just open a door, or put up a website somewhere. They expect to sell what it is they make or do without telling anyone they exist. Building your business is like building and then climbing a pyramid. The more you do, the farther away you move yourself from that large bottom slab. There are fewer competitors and the air is cleaner the farther up you move. If you do ANYTHING, even if it’s totally wrong, it’s easier to make corrections and move forward. 11. This one’s for you; share your business links, product links and anything else you’d like people to know about you and your business. Agilé Marketing Services specializes in building Recognized Expert Status for their clients. We help you become the go-to person in your industry or niche. We work directly with a select few clients, and provide books & ebooks, workbooks and online courses for others just getting their feet wet. You can visit the Agilé website at AgileMarketingServices.com and my author website at ScottGardnerAuthor.com. Also, check out my blog. Outstanding interview! A topic that I’ve found to be endlessly interesting. Thanks for some great information. We all use marketing everyday whether we think of it that way or not. Yes we do Arlee; glad you enjoyed the interview. Scott’s a wealth of information. We have to thank Scott for his words way more than thanking me for the post. Scott, I enjoyed reading your perspective on college, marketing and social media. Thanks for sharing. One of my favorite portions of this interview is your response to branding. That is sooo true, and explains why we keep drinking and eating foods that we shouldn’t LOL!! Mitch, thanks for giving Scott a forum here. Nice piece. Why did he go back to college, especially after saying “I went up from there. It took almost 15 years before I went back to college, and another 8 before I went back to get an undergrad degree in Marketing.”? Thanks for asking about college! Unfortunately, today you need a college degree for someone to hire you. (Note how I said that.) That’s so they can cover their @$$. I got an AAS degree in advertising through the Onondaga Community College art dept. That didn’t get me anywhere. I sold computers, then I fixed them. After that, I couldn’t get a marketing job without a marketing degree, so I played the game, did the dance, and got the degree. Then people wouldn’t hire me (in Syracuse – I can’t really move – long story) because they could hire someone else half my age with the same degree for a quarter of the price. So I had to go to work for the biggest jerk I know. Me! And I’ve been chief cook and bottle washer here for over 14 years. Thank you so very much for your kind words. As someone famous (I forget who) once said: People will forget what you tell them, but not how you made them feel. That’s the secret of good branding – have the consumer associate their warm-n-fuzzy feelings with your and your company! Great interview. I got my MBA in marketing and always believed in the phrase “Marketing is everything and everything is marketing.” It’s true. Oh and excellent points about choosing a brand name that is made up/invented vs straightforward. It really does depend.